Hope Aur Hum movie review: Leaves no room for hope! In a scene or two, Nagesh mentions “destiny” to suggest that it is one’s fate that invariably leads the way. A still from 'Hope Aur Hum'. Nostalgia grips many of us and at different stages of our lives, comes to stay with us too until we deliberately choose to wipe it out of our lives. Concurrently, clinging to some of the old things that belonged to us is a nagging monster that accompanies most of our waking hours. And, in many ways, others too. But if that is what Sudip Bandyopadhyay’s Hope Aur Hum is all about, the first query that one may have is that why it has such a vague title? It was, perhaps, for want of a better name that the filmmakers had to make do with whatever hurriedly they could have a consensus on. Hope Aur Hum has a thin plot heavily laden with many of his own experiences as a student. Drawing from one’s experiences works best if one also analyses them from a distance, and, also adds more substance on hindsight. Since the film is largely personal, one expected more. It doesn’t examine or probe the subtleties that lie hidden in many of the questions that, may be, bothered the director in his own evaluation of the ambiguities of his life. Hope Aur Hum may seem to weigh heavily on some of his inspiring familiarities and heartening encounters in his growing up years, but at times, one feels its utterly inane tone and lacklustre presentation conspire to diminish the rich resources and skills that he may have enriched himself with. 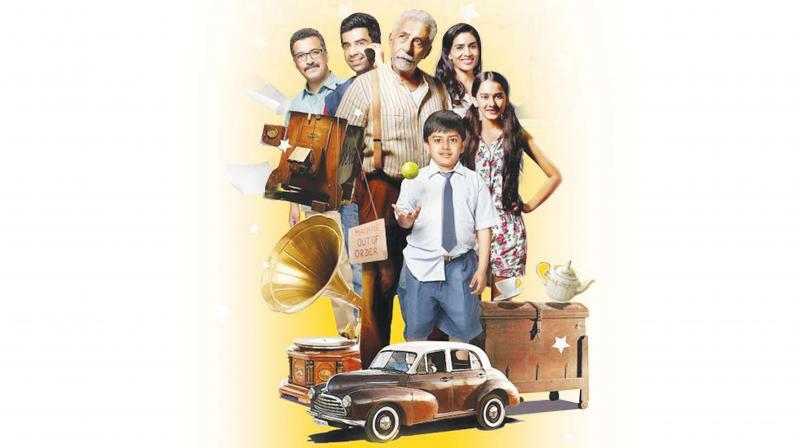 Set in the present day, the film has Nagesh (Naseeruddin Shah) earning the family’s bread and butter with a space-consuming out-of-order photocopy machine that always raises space and room issues for his granddaughter, Tanu. His elder son Neeraj (Aamir Bashir) and his wife Aditi (Sonali Kulkarni), along with their daughter and son Anu (Kabir Sajid), as well as, his younger son Nitin (Naveen Kasturia) seem like a happy family. When his grandson Anu encounters an interesting series of events at his Nani’s house away from the city, the world seems to be changing for the little boy, who also decides to be secretive about a few series of events he encounters. Nitin loses his phone and is seen doing his best to date a girl. Neeraj works hard, but the promotion that promises a raise at workplace eludes him. Each of them leads normal lives and holds on to hope whenever destiny intervenes and blows over their optimisms. What keeps them going is their response to change and how hope revitalises their present. As the doting wife and mother Aditi grumbles about her cramped and cluttered home that also houses a defunct German Soennecken photocopy machine that Nagesh believes to be a family member and is often seen talking to. But everyone resolves problems with ease and hardly any arguments ever come in the way of their happy home. Themes of loss of irretrievable old past joys or a longing for happier times of joy outgrown and gone by need not be so obviously stated in order to bring home the fact of yearning and drifting for yesterday’s old good times. Bandyopadhyay has little to offer in terms of joy cresting its peak, although I must confess that the child actor Sajid, Basher and Shah shine in their respective roles. Especially Sajid is endearing as a little boy who is yet to unravel the many mysteries of life around him. In many ways, a photocopy machine could serve as a metaphor signifying its outlived existence as the old order and paving the way for the new. In a scene or two, Nagesh mentions “destiny” to suggest that it is one’s fate that invariably leads the way. If Bandyopadhyay wanted to give us the futility of man’s desires and the significance of destiny he should have been more direct in his approach. Resultantly, the 95-minute film does stay loyal to a familial territory as gently as possible, it also goes all over the place in its bid to give us an insight into highs and lows of everyday life. Looking at life and its various stages through the joys and impediments between childhood, youth and old age, the story does give us a peep into vicissitudes with a sentimentality that’s moderate and meaningful. Wish there was more to be enjoyed here, for in the midst of all the chaos and failings, the fact that life does hold its meaning, necessitates more perceptiveness and comprehension!